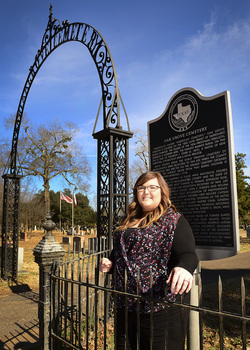 Heaven Umbrell, a Stephen F. Austin State University history graduate student, is working alongside members of the Friends of Historic Nacogdoches to create an index and map of Oak Grove Cemetery. NACOGDOCHES, Texas - Heaven Umbrell was 10 years old when she helped her grandmother, a gerontologist, conduct research in cemeteries. Years later, Umbrell now brings her children along when she engages in research at Nacogdoches' historic Oak Grove Cemetery. Umbrell, a Stephen F. Austin State University history graduate student, is working alongside members of the Friends of Historic Nacogdoches to create an index and map of Oak Grove Cemetery. She also is making a grid map of plots and digitizing written records of the people buried there. When members of the Friends of Historic Nacogdoches contacted Dr. Perky Beisel, SFA associate professor of history, about some endeavors they hoped to accomplish at the cemetery, Beisel immediately thought of Umbrell. "This type of work gives graduate students practical experience," Beisel said. "It also demonstrates what SFA's Department of History can help accomplish." Oak Grove Cemetery was originally named America's Cemetery. It spans 12.7 acres and contains an estimated 1,000 gravesites. Many gravesites contain the remains of notable historical figures such as Thomas J. Rusk, a political and military leader of the Republic of Texas who served as its first secretary of war and as a general in the Battle of San Jacinto. Rusk was later a U.S. politician and served as a senator from Texas. Other important historical figures buried at Oak Grove include Dr. Robert A. Irion, who was Sam Houston's personal physician, and four signers of the Texas Declaration of Independence. Hundreds of tourists visit the cemetery each year. An additional goal of the Friends of Nacogdoches is to obtain signage for each gravesite. "My research will give cemetery visitors access to these men and women and help tell their stories," Umbrell said. Umbrell expects to complete her portion of research by the end of spring 2018. Friends of Historic Nacogdoches anticipate the full project to be completed by the end of the year.